This report describes the histopathological findings in a patient with Acanthamoeba sclerokeratitis (ASK). A 58-year-old patient with ASK underwent enucleation and sections of the cornea and sclera were subjected to histopathology and immunohistochemistry with monoclonal mouse antihuman antibodies against T cell CD3 and B cell CD20 antigens. Hematoxylin and Eosin stained sections of the cornea revealed epithelial ulceration, Bowman's membrane destruction, stromal vascularization, infiltration with lymphocytes, plasma cells, and granulomatous inflammation with multinucleated giant cells (MNGC). The areas of scleritis showed complete disruption of sclera collagen, necrosis and infiltration with neutrophils, macrophages, lymphocytes, and granulomatous inflammation with MNGC. No cyst or trophozoites of Acanthamoeba were seen in the cornea or sclera. Immunophenotyping revealed that the population of lymphocytes was predominantly of T cells. Granulomatous inflammation in ASK is probably responsible for the continuance and progression of the scleritis and management protocols should include immunosuppressive agents alongside amoebicidal drugs. Acanthamoeba sclerokeratitis (ASK) is uncommon but sight threatening complication of Acanthamoeba keratitis. ,,, It is presumed to be either an immune-mediated,  or infective process  or both. This uncertainty has hindered formulation of effective management guidelines and the outcome of this condition often remains poor. ,, We report the histopathological findings in the cornea and sclera in a case of ASK, who had undergone enucleation for recalcitrant disease. 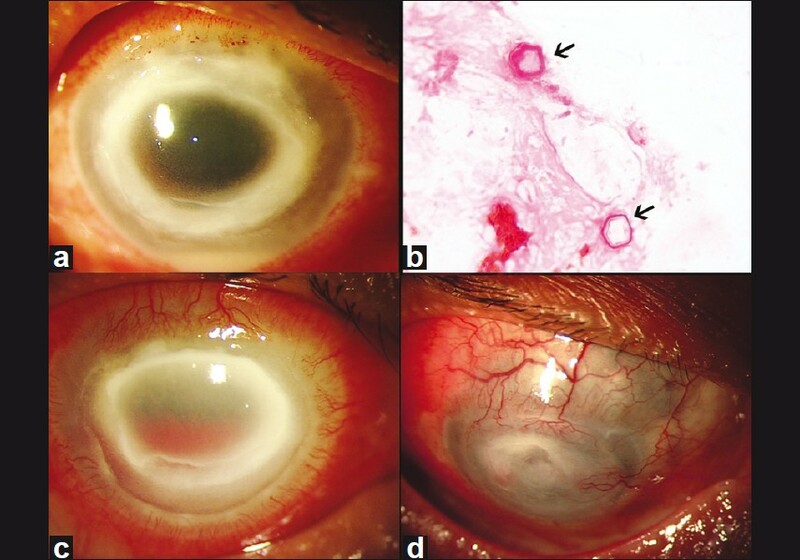 A healthy, 58-year-old farmer, who presented a month after onset of symptoms following trauma during agriculture-work, had been diagnosed with Acanthamoeba keratitis on the basis of typical ring-shaped corneal ulcer [Figure 1]a and detection of the characteristic double walled cysts of Acanthamoeba on direct microscopy [Figure 1]b. Treatment was with topical polyhexamethylene biguanide 0.02% 1 hourly, chlorhexidine 0.02% 1 hourly, atropine sulfate 1% TID, and oral ibuprofen 400 mg TID after food. Six weeks after presentation, he complained of increasing pain. On examination in addition to earlier findings there were engorged episcleral vessels nasally and globe was tender. He was advised to continue the topical amoebicidal drugs. Two weeks later he returned with severe pain. His vision was perception of light with accurate projection of rays. Slit-lamp examination revealed central ring-shaped infiltrate, peripheral guttering, vascularization, blood-stained hypopyon, and diffuse anterior scleritis in the supero-nasal quadrant [Figure 1]c. Intraocular pressure was digitally normal. B-scan ultrasonography was normal. A diagnosis of ASK was made and oral Prednisolone 60 mg daily (1 mg/kg body weight) was added. Random blood sugar was normal. Over the next few weeks scleral inflammation increased whenever the steroids were tapered and therefore the initial dose was continued. Eight weeks after diagnosis of ASK he was suddenly lost to follow-up. He returned 2 months later with severe pain. The reason he gave for his absence was development of diabetes mellitus, sudden worsening of his general health, and hospitalization elsewhere. The oral steroids were stopped and in course of time the topical drugs had exhausted. On examination vision was perception of light with inaccurate projection of rays. There was diffuse anterior scleritis and staphyloma in the superior quadrants [Figure 2]d. B-scan ultrasonography revealed only multiple low echoreflective point-like opacities in the vitreous cavity. Because of the poor visual prognosis, debilitated systemic condition, and intractable pain the eye was enucleated and sent for histopathology. Gross examination of the eye-ball revealed an ulcerated area in the cornea and an area of thinning with staphylomatous projection measuring 15 × 11 mm in the superior limbus between 11 and 2 o'clock positions. The eye-ball was grossed vertically to include the affected sclera and cornea, and the calotte was submitted for processing. Histopathology sections of the cornea stained with Hematoxylin and Eosin revealed epithelial ulceration with destruction of Bowman's layer. The stroma showed chronic infiltration with lymphocytes, plasma cells, and vascularization in anterior two-thirds. There was granulomatous reaction in the mid and deep stroma with prominent multinucleated giant cells (MNGC). The Descemet membrane was fragmented. 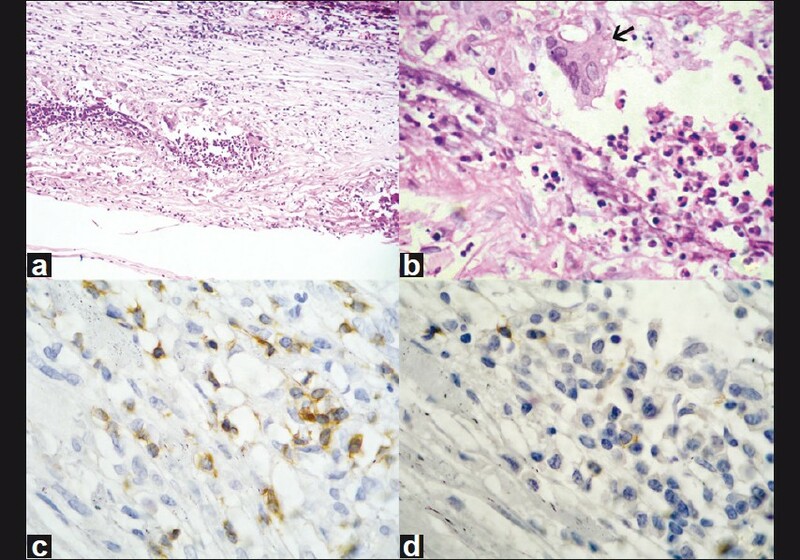 The area of scleritis showed complete disruption of collagen, necrosis, neutrophils, lymphoplasmocytic cells, and florid granulomatous reaction with prominent MNGCs [Figure 2]a and b. No trophozoites or cysts of Acanthamoeba in the sclera were seen even with periodic acid-Schiff stain. Immunohistochemistry was performed using monoclonal mouse antihuman antibodies (Dako, Denmark) against T cell CD3 and B cell CD 20 antigen. The inflammatory cells in the areas of granulomatous reaction were positive for T-cell marker CD3 [Figure 2]c and negative for B-cell marker [Figure 2]d.
Lee et al.,  proposed that ASK is purely an immune-mediated process on the basis of few available case reports that did not detect the organism from the sclera,  and on the belief that the organism rarely invades extra-corneal tissue. For many years there was only one published report documenting scleral invasion of Acanthamoeba,  and only recently was another case report published. It is interesting that in both cases the organism was isolated from biopsy taken during the acute stages and the organism was not detected later when the eye was enucleated. The failure to detect the organism in other reports and in our case could be due to the timing of the biopsy. It is possible that in the late stages of ASK, no viable organisms remain and the clinical picture then is only due to persisting inflammation. In our patient T cells were detected predominantly in areas of granulomatous inflammation. This is in contrast to previous reports where lymphocytes were not observed in corneal tissue sections in cases of Acanthamoeba keratitis. Granulomatous inflammation is known to be initiated by antigen-specific and non-specific T cells which are not only responsible for the recruitment of macrophages to the site of invasion but also the release of various chemokines and cytokines like osteopontin and tumor necrosis factor. The role of cell-mediated immunity and delayed hypersensitivity responses in ASK needs further investigation. The onset of scleritis may be masked by the keratitis leading to delay in diagnosis and treatment. Severe pain, globe tenderness, engorged episcleral vessels, anterior uveitis, and scleral thickening on ultrasonography in any patient of Acanthamoeba keratitis should raise suspicion for scleritis. , In case laboratory diagnosis with routine microscopy, culture or biopsy is inconclusive, polymerase chain reaction may be helpful although this is often not widely available. It is difficult to identify risk factors because ASK is not common and few reports exists in the literature. Possible risk factors proposed have been overwhelming corneal infection and the use of topical steroids. Our patient did not give history of topical steroid use prior to presentation. Favorable outcome is reported with the concurrent use of amoebicidal and immunosuppressive drugs. It appears from previously published reports , and findings in our study that in the initial stages an infective process dominates while in the later stages the inflammatory responses dominate. Granulomatous inflammation probably plays an important role in initiation and continuation of the inflammatory component of the disease process. The outcome in our patient could have been different if ASK was detected initially, had he not been lost to follow-up or diabetes had not developed or if detected early, steroid sparing immunosuppressive agents had been used. In conclusion the findings of an underlying immune-mediated mechanism in our study provides support to the proposition  of including the use of immunosuppressive agents alongside amoebicidal drugs in the treatment of ASK. Mannis MJ, Tamaru R, Roth AM, Burns M, Thirkill C. Acanthamoeba sclerokeratitis. Determining diagnostic criteria. Arch Ophthalmol 1986;104:1313-7. Dougherty PJ, Binder PS, Mondino BJ, Glasgow BJ. Acanthamoeba sclerokeratitis. Am J Ophthalmol 1994;117:475-9. Lee GA, Gray TB, Dart JK, Pavesio CE, Ficker L, Larkin F, et al. Acanthamoeba sclerokeratitis: Treatment with systemic immunosuppression. Ophthalmology 2002;109:1178-82. Ebrahimi KB, Green WR, Grebe R, Jun AS. Acanthamoeba sclerokeratitis. Graefes Arch Clin Exp Ophthalmol 2009;247:283-6. Williams GT, Jones WJ. Granulomatous inflammation- A review. J Clin Pathol 1983;36:723-33. Co DO, Hogan LH, Il-Kim S, Sandor M. T cell contribution to the different phases of granuloma formation. Immunol Lett 2004;92:135-42. Kremer I, Cohen EJ, Eagle RC, Udell I, Laibson PR. Histopathologic evaluation of stromal inflammation in Acanthamoeba keratitis. CLAO J 1994;20:45-8. Mietz H, Font RL. Acanthamoeba sclerokeratitis with granulomatous reaction involving the stroma and anterior chamber. Arch Ophthalmol 1997;115:259-63. Holbach LM, Font RL, Naumann GO. Herpes Simplex stromal and endothelial keratitis. Granulomatous cell reactions at the level of Descemet's membrane, stroma, and Bowman's layer. Ophthalmology 1990;97:722-8. Garner A. Pathogenesis of Acanthamoebic keratitis: Hypothesis based on histological analysis of 30 cases. Br J Ophthalmol 1993;77:366-70.